One fall day, when the sky was quite blue and half the leaves were still on the trees and half were on the ground, I went out to the garden with rake in hand. I wasn’t planning to do a lot of raking, but merely wanted an excuse to be out in the garden on a beautiful day. As I poked around at the leaves, raking up little piles here and there, my rake suddenly got caught on something. At first I thought it was a tree root, but when I got down on my knees for a closer look, I could see that it was the corner of a metal box of some kind. “What could this be”, I thought, as I laid the rake down to mark the spot before running to the garage for a shovel. Within a few minutes, I had dug up the box and gingerly opened it, thankful that the lock and hinges hadn’t rusted close. Inside was a single sheet of paper on which someone had written “The First Secret to Achieving Happiness in Your Garden”. The first secret to achieving happiness in your garden is to grow the plants you love. Grow the plants you love. Grow the plants you love - exactly! If you want to be happy in your garden, you should fill it with the plants you love. It was so eloquently stated in those five words. “Grow the plants you love.” When we plant what we love in our gardens, we will love the plants in our garden. 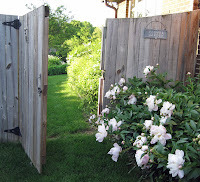 We will want to be out in the garden, enjoying those plants in all seasons, watching them grow, flower, and set seed. We will be on our way to achieving happiness in our gardens. Oh, it seemed so simple! 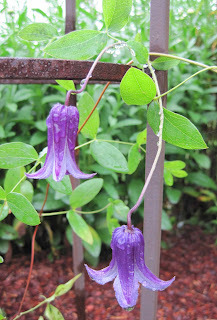 Perhaps deceptively simple, for I realized then that not everyone has plants they love in their garden. Sometimes we inherit our gardens from someone else and find that the plants they loved are not the ones we love. May I suggest if that is what you have in your garden, plants loved by a previous gardener but not by you, that you dig them up and pass them along to someone else who will love them? If the plants can’t be safely transplanted, dig them up and remove them anyway. Sometimes we fall in love at first sight with a new plant, but then once it is in our garden, we realize that we misjudged it. It isn’t what we thought it would be and we really don’t love it at all. I recommend you dig those plants up, too, and either compost them or pass them along, if you want to achieve happiness in your garden. Sometimes we think that we have too many of one or more of the genus of plants we really love, like roses or daylilies or even agaves, so we stop ourselves from getting more of them, even though we love them. “Frosted Pumpkins”, I say! 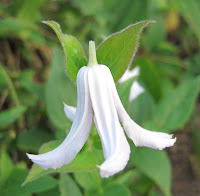 If you love a particular genus of plants that much, by all means, grow a lot of them in your garden. And sometimes we see a plant at the local garden center that we fall in love with, but for some reason, we talk ourselves out of buying it. We convince ourselves that we can have a garden without it. We walk away from it. Don’t do that! Buy that plant and plant it in your garden. Otherwise, you will think constantly about that plant you didn’t get, and it will cause you to not be happy with the plants you do have. Grow the plants you love. What a simple, straight forward secret. And with the first secret revealed, I knew that my walk down this garden path toward achieving happiness in my garden had just begun. I knew that somewhere there were more secrets to be discovered, and that somehow, I would discover them. One early spring day a few years ago, I was sitting in my favorite spot by the window lazily browsing through some very old issues of Horticulture magazine. I came to own these magazines when someone I once worked with paid one dollar for a big box of them at an auction and then gave me all the issues from 1959. As I casually flipped through the pages, I happened upon the classified advertising in the back of the August 1959 issue and began to read some of the ads. Lloyd Kyler of South Whitney, Indiana was advertising “Red Gold Hybrid Earthworms” for soil improvement. You could get 500 of them for four dollars, or a thousand for seven dollars. You could also buy 40 surplus iris “mixed some pinks” for five dollars, post paid from Seville Iris Gardens of Statesville, North Carolina. If you wanted them labeled it would cost an additional five cents each. Or for just fifty cents you could get a catalog of hardy violets with recipes from the Vista Violet Farm in Vista, California, and they would deduct fifty cents from your first order. And then I saw something in very tiny print sandwiched between the headings “Rare Plants, Trees and Shrubs” and “Terrarium Supplies” that I thought said “Secrets”. I could not make out the very tiny print even with my glasses on, so I got out a magnifying glass. Peering through it, I realized that I had just discovered the second secret to achieving happiness in your garden. Size your garden for the resources you have. Of course! Reading this was like a smack in the head, like discovering an overgrown zucchini hiding under the oversized squash leaves. To be happy in our gardens we should have a garden that is a size that we can manage with the time, money, and help we have! Does this mean we are all now destined to have small gardens? Absolutely not! It means that we need to do a little planning and a little saving, and not be afraid to ask for, or pay for help in the garden when needed. There are all kinds of books written on the subject of “low maintenance” gardens, which many gardeners refuse to look at because they say they enjoy all the maintenance they have to do in their garden. But don’t be too quick to judge! Spending an entire weekend on the maintenance of your garden may seem like heaven on earth, but if it is week after week after week, and you still have more to do, it may soon seem more like drudgery on earth. Books are full of ideas to reduce the time spent on the routine and not so routine garden maintenance tasks we all face. Incorporating these ideas into how you garden could mean you can have a larger garden overall. There are also some aspects of gardening that could take hours or weeks or months to do if we try to do them on our own. Yet sometimes we decide to try to do them anyway and then end up too exhausted to enjoy what we’ve accomplished. Or worse, we realize half way through whatever it is we are doing that we can not possibly finish the job on our own. We leave it half done while we try to figure out “now what”. For these big jobs, we should save up to hire others to help, or find some friends and family to help. This second secret to achieving happiness in our gardens may mean that we don’t have that big garden of our dreams right away. It may mean that we decide to leave an area planted with lawn until we have the time and resources to plant the garden we want to have there. Or it could mean that we confine our garden to a smaller space that we can enjoy, where we can find happiness. Reading this secret over and over, I realized it would not be easy to follow and could perhaps be controversial. We are so eager as gardeners to dig up everything and just start planting! But at the same time I knew this second secret was right. And you’ll be happier with the overall results. Buy good tools because it will make your work in the garden more enjoyable. 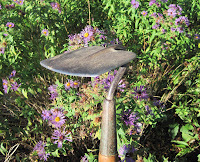 When you use cheap or poorly made tools, your focus is usually on the tool and trying to get it to cut or dig or hoe or whatever you are trying to do. You lose sight of the pleasures of being among the plants and flowers as you get soaked by a poorly made hose end sprayer. You get frustrated when your pruners just mash the stem of the plant and don’t cut it off cleanly. You get tired trying to dig with a cheap shovel. Having found three of the five secrets to achieving happiness in your garden, I was on “high alert” for signs of the fourth secret. As I walked around the garden each day, I found myself stopping to look under every rock for signs of a piece of paper, a box, something, anything that might contain the fourth secret. Whenever I picked up an old magazine or gardening book, I caught myself not necessarily reading it, but instead looking in the margins and between the lines, hoping that the fourth secret would soon be revealed. Then just as I was about to give up on ever finding the fourth secret, I noticed a thin thread, almost a spider web, attached to my back door. Normally, I would have just brushed it aside, but something made me wanted to follow that thread to its end point, to see what might be there. I slowly started walking across the patio, thread in hand, and soon found myself crouched down looking under a rather large Viburnum shrub wondering if I should really attempt to crawl under there to see where the thread went. Just then I heard a little giggle and felt a tickle on my backside, as though someone was trying to put something in my back pocket. Instinctively, I reached back and felt a piece of paper sticking up out of my pocket. I slowly pulled it out and unfolded it. Yes, it was the fourth secret. It was powerful. It was brief. Just three words. Three very important words. 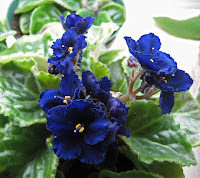 We respect Mother Nature when we accept the hardiness zone we are in and choose plants that will do well in our zone. We respect Mother Nature when we compost and use that compost to amend the soil in our gardens. We respect Mother Nature when we choose organic methods and eliminate the use of pesticides in our home gardens. We respect Mother Nature when choose plants that will attract bees, butterflies, birds and other critters to our gardens. The fourth secret and three powerful words. I suspected that it was the garden fairies who set up that elaborate scheme with the thread to get me to kneel down enough so they could slip that fourth secret into my back pocket. I suspected it, but I had no way to prove it, to know for sure. The only thing I knew at that point was that there was a fifth and final secret to achieving happiness in your garden, and I would give almost anything to find out what it was. I was going through a big stack of clay pots one day, sorting them by size and wondering where they all came from. Since most of the plants I’ve purchased in the last umpteen years were generally grown in plastic pots, I found it hard to believe that I had so many of these clay pots, but I did. Some I got from my Dad. I remember stopping once at an old dilapidated greenhouse with him when I was a kid and buying a whole bunch of four inch clay pots. I think I have most of them now. My sister in law brought me some other clay pots that her parents found when they were cleaning out their basement. And my Mom’s neighbors gave me another stash of pots when they were cleaning out their shed in anticipation of moving. As I started to sort the pots by size, I found one oddly sized pot that was a different size than any other clay pot in my stash. As I held it in my hand and looked it over, I realized that someone had scratched words on the inside of it. Could it be the fifth secret? The fifth secret to achieving happiness in your garden is to share your garden. Let others see your garden. Give others passalong plants from your garden. Give away vegetables and flowers from your garden. Share what you know about gardening by showing others how to garden. And most of all - share your love of gardening and plants with anyone who is willing to try to garden, too. 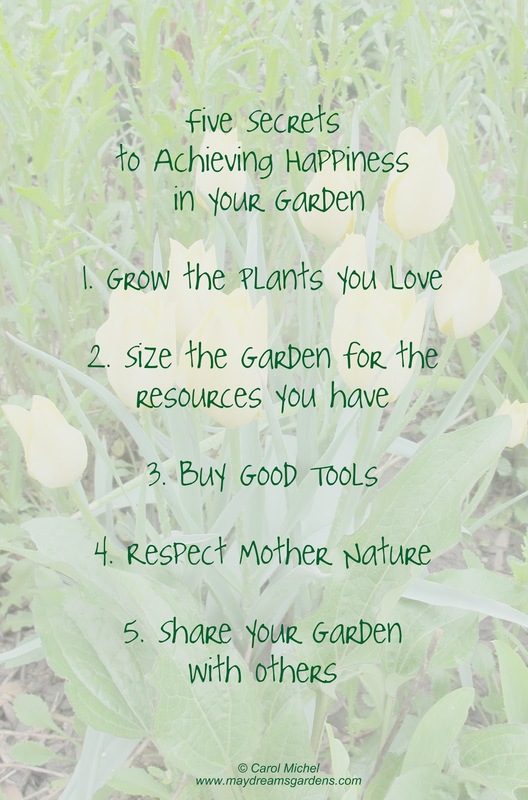 Share your garden, the fifth and final secret to achieving happiness in your garden. But is it really the final secret? The door creaked as I slowly opened it, announcing to any who might be inside the shed that someone was entering. I could imagine garden fairies scurrying to their hiding places and actually saw a few meadow mice as they disappeared through a small hole in the wall. Who knew when sunlight had last lit the interior of that shed? It had just one window covered over by an old piece of burlap, the kind used to wrap newly dug trees. I entered for only one reason. I wanted to leave a copy of the Five Secrets to Achieving Happiness in Your Garden there so that one day another gardener might find it. After one last look around at the clay pots, seed packets and gardening tools that were strewn about the shed, I placed the book on the potting bench and left quietly. As I walked down the overgrown garden path back to my own garden, I knew that the book was safe in that shed and that someday another gardener would find the secrets and use them to achieve happiness in their garden, just as I had used them to find happiness in mine.